Home » Jonny » I’m fantasizing about a Big Hunk! ZING!!!! I’m fantasizing about a Big Hunk! ZING!!!! This summer has been insane for us here at The Candy Gurus. We’ve been trying to review as many new and different candies for y’all as we can, we’ve been making great relationships with various candy companies, and we’ve been buying candy left and right. Trust me. We have. Lost in this sometimes is a little old school flavor. A nod to the boys that got us here. And even when we DO give a shout to the classics, some of the real heroes get ignored, but not by design. There’s just too many stellar candies to name them all. Or are there….? Ladies and Germs, I present to you an American classic. An underrated bar SO good that it scares me. It scares me because I could easily snarf two of these down a day, no problem. And THEN have my usual candy ration. It’s a problem. Ahh, the hunk. He’s big, no doubt. And he’s different. Try to come up with even one candy that’s all like the Hunk. You can’t do it, cause this guy stands alone. 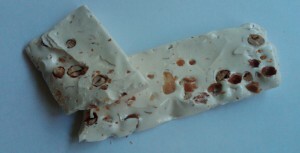 Check it: it’s honey sweetened nougat with fresh roasted peanuts. That’s it. But for this dude, it’s all about consistency. When you first bite into it, it’s hard, yet chewy with a little give. And as soon as you stumble onto a peanut or two (and you will, cause they’re all over the place), you get that salty, crunchy burst of love. And it goes on and on like this for quite some time. It’s a slow chew, and I mean that in the best way. The flavor is just solid. A malty, honey-esque, taffy-like salty playground. Seriously, seriously quality stuff up in this piece. Nothing more to really say about it besides buy one. I know, you haven’t even noticed them but they’re there-at your gas station, 7-11, all over the place. Pick one up, and then devour it while watching “Big Brother*” on the couch. I know it works for me. BH is top 5 candy absolutles. The name though…never loved that. Also – brown/black packages should be for chocolate no? Haribo gummi bears and Big Hunks are my favorite candies EVER. I like my gummis stale (hard) and my Big Hunk’s frozen. ‘Nuff said. Oh, and you are a RIOT.